Thoughts from a Traveling Tech: Whatever happened to equality of the sexes? Through the years I have heard all about how women have it rough and that they want equal treatment. They demand equal treatment then want special treatment at the same time. I have always worked to treat my fellow female employee with respect and as an equal and yet I still hear about equality. I believed this. But then I was onsite at a customers site and realized that we have been lied to as men. A kind young lady, who shall remain nameless as I am sure the legions of women will want to take retribution upon this traitor, brought to me evidence of the true state of affairs. Proof that we men really are actually getting the short end of the stick. She brought me a picture she took while in the women's bathroom, a place so mysterious that men shudder at the thought of entering that distant and strange land. A picture that will surely put a crack in the steely front women present when discussing equality. Something that defines the true equality in this world. 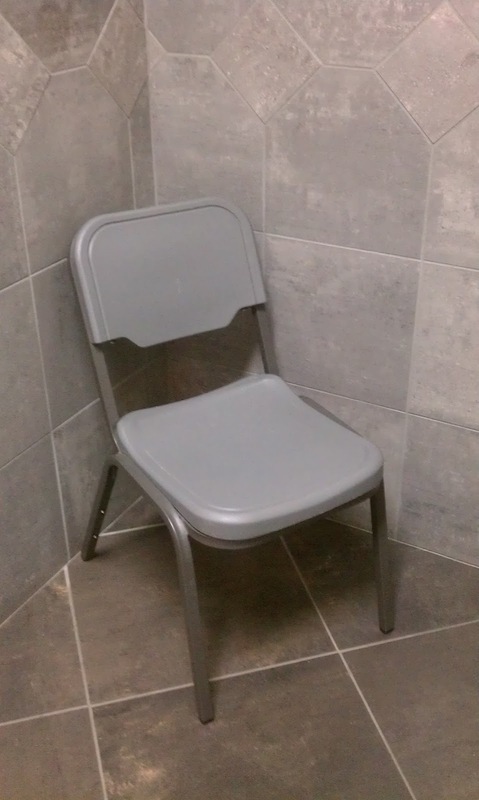 The truth is that they have a couch in there but the men's room has only this lowly plastic chair. And they have Charmin, too! So much for equality, huh?